BoardGaming.com> Games> Board Games> Super Mario Level Up! Join Mario and his pals as you advance them up the Mushroom Kingdom while challenging other players to gather the most coins and reach the castle at the top. Once a character is advanced to the top board, players vote to see if the character stays or is kicked off the Mushroom Kingdom. It takes only one NO vote to get them off the board. And players should use the NO votes wisely as each player has a limited number of NO votes in their hand. The round ends when the character is unanimously voted to stay at the top. 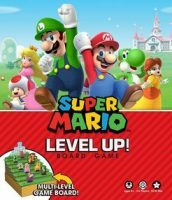 USAopoly presents How To Play Super Mario Level Up! Add a Review for "Super Mario Level Up!"  Super Mario Level Up!